The Phillies free-agent signing of starting pitcher Cliff Lee sent shockwaves throughout the country. Lee was supposed to bolt to the Yankees or stay with the Rangers. In the biggest swerve of the offseason, Lee decided to return to the City of Brotherly Love. Philadelphia already had the Big Three of Roy Halladay, Cole Hamels and Roy Oswalt. Now it’s the Big Four, or whatever moniker you desire, with the addition of Lee. So now, the expectations are through the roof. Many questions have been proposed. Can each individual pitcher win 20-plus games? Who’s better, Lee or Halladay? Only three pitchers in baseball had over 20 wins last year: Roy Halladay (21-10), CC Sabathia (21-7) and Adam Wainright (20-11). In 1969, the “Year of the Pitcher,” 15 pitchers had 20-plus wins. It’s a different era now. 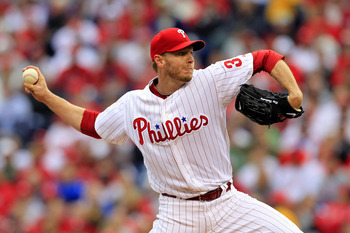 Roy Halladay led baseball with 250.2 innings pitched in the regular season. In 1969, Gaylord Perry led baseball with 325.1 innings pitched. Don Drysdale on the Dodger staffs of the 1960s. The Mets duo of Dwight Gooden and Ron Darling led the way for the Mets in the 1980s. Another tidbit to put out there. The top three WHIP leaders from last season are in the “Big Four”: Cliff Lee (1.00), Roy Oswalt (1.03) and Roy Halladay (1.04). Cole Hamels, the other entity of the “Big Four,” had a 1.18 WHIP. It’ll be interesting to see how this staff gets recognized from a statistical standpoint in the all-time ranks as the season progresses. Now it’s time to see what this potentially, all-time, dominant staff can do out on the field. That’s the biggest question of them all. Can they bring home another World Series crown? This has been the most interesting Phillies question during the offseason: Who’s going to be the fifth starter? 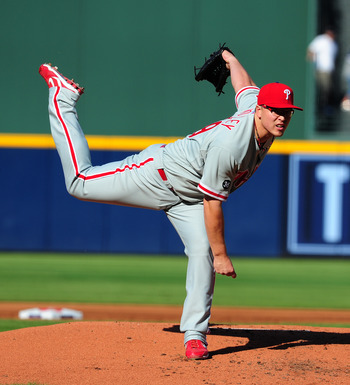 As of Jan. 24, Joe Blanton is still a Phillie. He’s the x-factor to the answer of this question. After the enormous financial signing of Lee, the Phightins are looking for some salary relief. Blanton is owed $8.5 million dollars in each of his next two years. Amaro is looking for a trading suitor that would be willing to take on a substantial amount of what’s left of Blanton’s contract. There are plenty of teams interested in Blanton. So, now we turn to Kyle Kendrick and Vance Worley. When you think of the 15-win plateau, the name that immediately comes to mind is Greg Maddux. He had 17 consecutive seasons of 15-plus wins. I think of Roy Oswalt as a “poor man’s” Greg Maddux. You know what you’re going to get from Oswalt year in and year out; he’s just a fiery competitor. Oswalt simply wanted out of Houston last year as the team was clearly in rebuilding mode. He was a measly 14-18 in his final 50 starts as an Astro. After coming over from the trade from Houston Oswalt dominated, finishing 7-1 with a 1.74 ERA and .89 WHIP. The competitive fire of Oswalt came out during the Phillies playoff run. The former 2005 NLCS MVP added a nice changeup to his bevy of pitches. He throws it with a claw grip. He’ll bend your knees back with a slow, 12-to-6, 69-70 mile-per-hour curveball. He locates his fastball well and keeps the ball down. At 27 years old, Hamels is the only one under the age of 30 out of the big four. I look for him to emerge this season. He’s hitting the prime of his career and should have the best year of his career. This is an article I wrote back on Sep. 15. Cole Hamels is no longer a two-pitch pitcher. Cole has one of the most devestating changeups in the game. He’s added a cut fastball and curveball to his repertoire. The 2008 World Series MVP has gotten stronger. He’s added velocity to his fastball, now approximately 92-96 MPH. Before it was about 90-92. 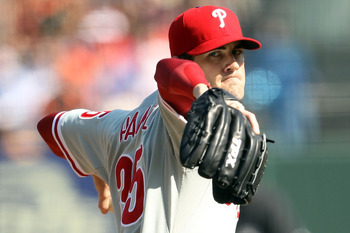 The most underrated aspect in Hamels’ rise has been his maturity. Before, he used to have those “blowup” innings. His emotions used to get the best of him. We’ll see if he can keep those emotions in tact throughout the season. It took a five-year, $120 million dollar contract to get him. 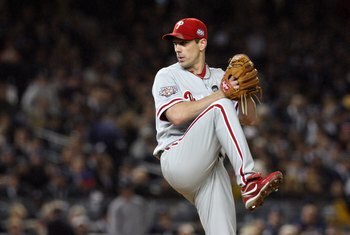 Cliff Lee’s sole purpose is to help the Phillies win another ring. And he’s been the hottest postseason pitcher for two consecutive seasons. 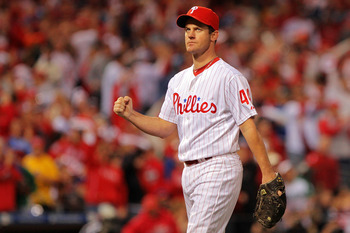 In 2009, Lee is predominantly recognized by Phillies fans for his amazing Game 1 World Series performance against the New York Yankees. He threw a complete game, allowing six hits and throwing 10 strikeouts in a 6-1 Phillies win. Last year, Lee guided the Rangers all the way to the World Series before falling to San Francisco in the World Series. So, in two years of postseason play, Lee is 7-2 with a 2.13 ERA, a .82 WHIP and three complete games. He’s racked up 80 strikeouts as opposed to only eight walks. The reigning NL Cy Young Award winner terrorized the National League last season. Not only did the man throw two no-hitters, Halladay’s name stood atop many of the pitching categories in the National League. He led the senior circuit in wins (21-10), complete games (nine), shutouts (four) and innings pitched (250.2). He finished second in strikeouts (219) and WHIP (1.04) and third in ERA (2.44). The guy throws everything at you. The accuracy and late movement on his sinker and cutter on both sides of the plate is extraordinary. He doesn’t walk anybody. Halladay can also throw a tight curveball with plenty of tilt at any point in the count. He is simply a workhorse.